For generic situations, the terms pericenter and apocenter are used for naming the extreme points of orbits where the primary is not specified, (see table, top figure); periapsis and apoapsis (or apapsis) are equivalent alternatives, but these terms, frequently, also refer to distances, i.e., the smallest and largest distances between the orbiter and its host body, (see second figure). 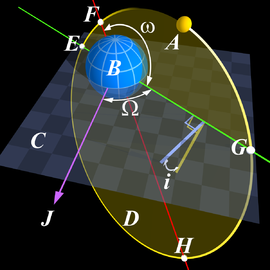 When discussing a satellite of Earth, including the Moon, the point of least distance is the perigee (/ˈpɛrɪdʒiː/), and of greatest distance, the apogee, (from Ancient Greek Γῆ (Gē), "land" or "earth"). There are no natural satellites of the Moon: for man-made objects in lunar orbit, the point of least distance may be called the pericynthion (/ˌpɛrɪˈsɪnθiən/) and the greatest distance the apocynthion (/ˌæpəˈsɪnθiən/); or perilune and apolune are sometimes used.